As I type this, I'm lying on my bed, warm and clean and relaxed -- but also sad that Book Expo America (BEA) 2013 has come to an end. This was my second year attending the expo, and my love for how it brings book lovers, authors, publishers and booksellers together has grown exponentially. There were definitely a lot of long waits and tired, aching shoulders and feet, but at the end of the day, this 2013 experience was just magical. I have to give it up for the amazing organizers and BEA volunteers, as the way things were running this year was very, very good. The autographing area, in particular, was constantly crowded, but the lines were well-maintained and monitored. The publishers also did a phenomenal job with their galley drops, events and various displays! It was pretty fun to alternate between waiting in line for signings and wandering around the floor to see all the new books I could look forward to this year. Plus, everyone I met was so very, very nice! So on Wednesday, once I got off work, I went straight over to Grand Central to meet Rachel at Pershing Square Central Cafe. I have never eaten there before, but it was fun, especially as it made us both remember the movie Friends with Benefits. We then cabbed it to the airport to pick up Elena and cabbed it right back to the City to try and catch the tail end of the Teen Author Carnival at the Jefferson Market Library. Even though we missed all the panels (which I'm sad about, as it sounded AMAZING), we did manage to make the massive signing! I got to say a quick hi to Melissa Walker (author of Unbreak My Heart), who I've caught at a couple of New York events. It was fun chatting about her daughter's first book pick from Books of Wonder and the paperback cover of Unbreak My Heart! I finally, finally, finally got the opportunity to meet four of my favorite people - Kat Zhang (author of What's Left of Me), Erin Bowman (author of Taken), Susan Dennard (author of Something Strange and Deadly) and Sarah J. Maas (author of Throne of Glass), who are all going on the Young Authors Give Back tour in the next few weeks (and you'll see a separate post on this soon, I think). I love them all, as they have a spectacular group dynamic and they're the sweetest, nicest, funniest people. It was surreal to see them all together AND in person, and I think my fangirling hit an all time high! We were the last ones out of the library because we were joking around and gushing too much about anything and everything possible. I don't think I'll ever forget that moment - getting a chance to say hi and gush to Kat, fangirling over Chaol with Erin, the recognition in Susan and Sarah's faces. It was certainly a highlight of my week. The day dawned bright and early, but Elena and I were really excited to make our way to Javits (the J) for the first day of BEA. I met up with Estelle, and we made our way to the room where the Harlequin Teen Breakfast was being held. After saying hi to a bunch of blogger friends and grabbing some food and coffee, we settled at a table (along with Kaye and April) to wait for the event to start. 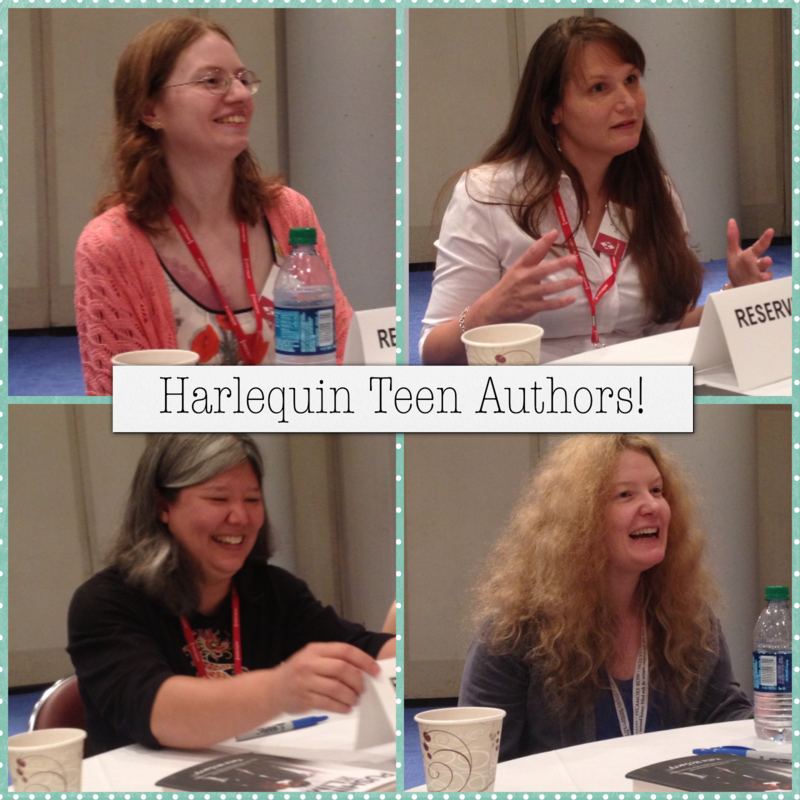 It was a Round Robin-type affair, where each table got the chance to visit with Harlequin authors and members of the Harlequin team. The authors - Julie Kagawa (author of The Immortal Rules), Amanda Sun (author of Ink), Katie McGarry (author of Pushing the Limits), Elizabeth Scott (author of Heartbeat) - were all really interesting to chat with, and it was fun to ask them questions. It was also interesting to meet some members of Harlequin Teen's team and learn about their jobs. I was incredibly honored to be invited, so thanks Harlequin Teen! After that, the day was a blur of signings and book drops and booth visits and hanging out with blogger friends! I got the chance to see Diana Peterfreund (author of For Darkness Shows the Stars), Amie Kaufman and Meagan Spooner (co-authors of These Broken Stars) and Sarah J. Maas (again, but for Crown of Midnight - EEP! ), which was amazing. These two are among my top authors I wanted to catch at BEA and I'm so glad I did! Amie Kaufman, Meagan Spooner and me! We (Elena and I) left a bit early because we wanted to go to Housing Works Bookstore Cafe to attend the Tumblr: We Are Young event featuring Rainbow Rowell, Ruthi Baron and Eliot Schrefer. The event was lots of fun, with a very casual atmosphere as well. It was great to hear each of the authors give their speeches, and hanging out with Rainbow was lots of fun! She signed my copy of Attachments, and I can't wait to read it! I ran right after that to make it to the simultaneous signings of Kat, Erin and Susan -- and I managed to hit up all three! It was also really cute to see Sarah running around and taking photos and helping out with Susan's raffle. I was also able to see Jenny Han and Siobhan Vivian (co-authors for Burn for Burn), grab a galley of Maggie Stiefvater's book The Dream Thieves and then go and attend the panel about realistic YA hosted by Margot. My last big event of the day and one of my BEA highlights was having the opportunity to meet Samantha Shannon (author of The Bone Season)! I went home for the night, mostly because I wanted to finish Crown of Midnight (which is phenomenal by the way. 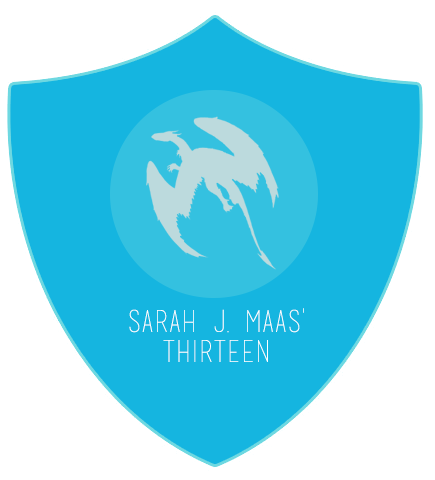 It's the follow-up to Sarah's book Throne of Glass, which I loved, and it's darker, more intense, very twisty and just absolutely wonderful!). Saturday started off a little later for me than the other days, but I still hopped on the subway early to get to the Bloomsbury brunch. It was nice to just munch on donuts and drink coffee and mimosas and chat about books. 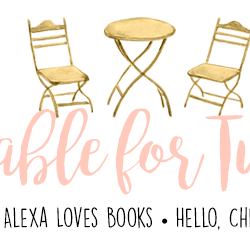 I enjoyed meeting Bridget, Katy and Erica, as well as hearing about their latest offerings, chatting about TV shows and Targets and whatever else came to mind. We also got a tour of their offices, which was so cool, and met Murray! 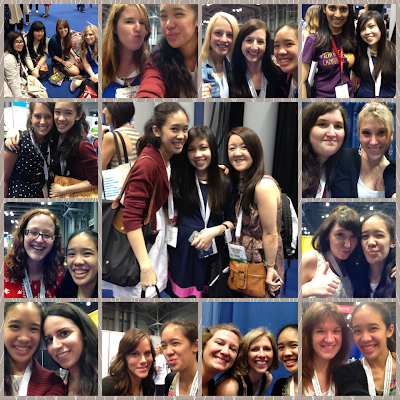 Once I made it to Javits (after a failed errand), I headed to the Harper booth to visit the girls from Epic Reads. They had an awesome hour-long event where people could spin to win things, and they also had awesome book shimmy shirts! While I was waiting for them, I was lucky enough to see Alexandra Bracken (author of The Darkest Minds) and got my ARC signed! I finally got a photo with Snarkles too. I hung out for a bit and chatted with Gaby, Elena and Jeremy & Jeffrey West, as well as Sarah, Susan, Kat and Erin. Saying goodbye to everyone (even temporarily) made me really sad! I still can't believe that it's over, and that I won't get to see some of my favorite people for another long while. 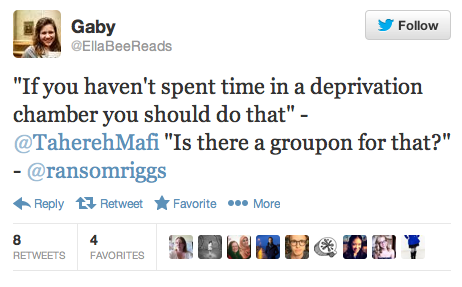 Sunday, June 2: Post-BEA, a.k.a. Fantastic Summer Reads! 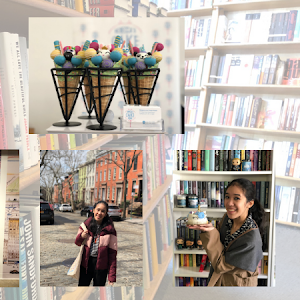 As if I hadn't had enough exposure to books, I joined my friends Elena, Gaby, Rachel and a couple of others for the Fantastic Summer Reads event at Books of Wonder featuring Ransom Riggs, Tahereh Mafi, Lauren Oliver, Elizabeth Norris, David Levithan and Andrea Cremer. After the Q&A, we all lined up for the signing -- and I FINALLY met Tahereh Mafi. You guys, she's fabulous (and was wearing the cutest leggings)! I was honestly surprised to find out she knew who I was and what my Twitter handle was, and I may have flailed a bit. Plus, she, Ransom and I chatted a bit about the Philippines (Filipino readers, they will be back to visit next year!). I LOVED IT. 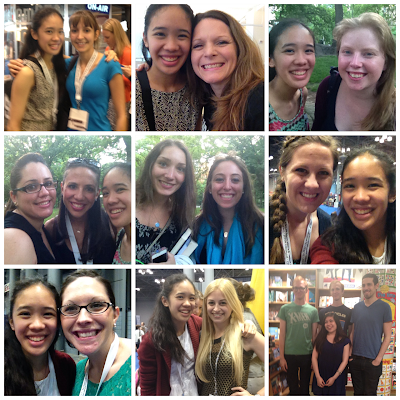 Apart from all these great opportunities and wonderful authors, my favorite part of BEA was by far meeting bloggers! I loved being able to reconnect with old friends, as well as getting to know the people I'd only talked to on Twitter or the blog. In fact, this made me start an impromptu series of selfies with the bloggers I was able to meet, though sadly I didn't get everyone. Still, if we met at BEA, know that I consider it a true pleasure and hope I see you next year! All in all, BEA 2013 was a fun and extremely magical experience! I met so many more people this year, as well as felt a whole lot more comfortable wandering the booths and talking to the publishing people who were there. I felt less stressed out, and managed to be more selective about the books I got, which is definitely a blessing to my reading pile. Best of all, I got to meet my blogger friends and turn them into real life friends. I'm definitely coming back for me next year! This honestly sounds like the best thing ever! I'm glad you had such an amazing time, and I love the pictures! Plus, meeting all those bloggers and great authors sounds incredible. In my head, I am planning my trip to NYC for next year's BEA, but I think I need to save some more for that haha. Alexa!!! I'm so happy I finally got the chance to meet you, even if it was a total whirlwind. I hope we run into each other at more bookish events soon! 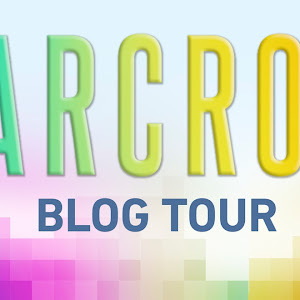 Are you planning to go to Fierce Reads in a couple of weeks? I'll be there as long as I don't have to work! Is this weird that I feel like tearing up? Honestly, your post is amazeballs. I am bookmarking this so I can visit this post again and again since it totally made my day. I live in Europe and yes, it costs a ton of money to even purchase a plane ticket to the states and when I get rich, I'll book a ticket every year so I can go to every BEA. Ha! For real though, lol. It's like a dream I'm living through different bloggers and reading your post made me smile a lot. I'm so glad you had a fantastic time. Yay!!! 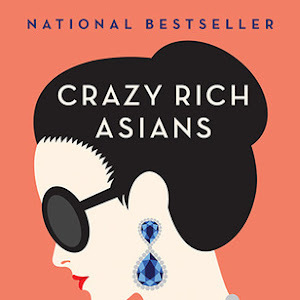 I feel like I see you at every book signing I go to (I was at the one at Books of Wonder last night), and I'm always like, "I bet she's a blogger." I've always wanted to ask, but it felt creeper-ish. But now that I've stumbled on it, I'll say Hi next time. This is such a great post! I'm trying to get everything together to make my BEA post but in the mean time I am loving hearing about everyone else's experiences. 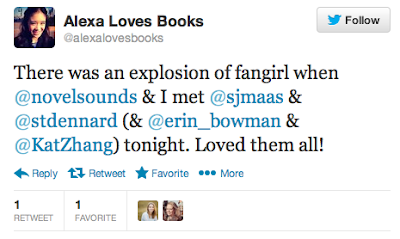 Sounds like you had a fabulous time and met some awesome people - authors and bloggers alike. This trip has definitely sealed the deal that I am in love Sarah, Susan, Kat, and Erin. LOOOOVED meeting you, Alexa!!! Such a great time seeing your face here and there. You're such a lovely lady and I'm thrilled to know you. BEA was great and I hope I can get back there! What an awesome round up!!!! Wow, that looks awesome! I hope to go to BEA sometime in the future, it looks like so much fun! Fantastic post! I'm linking to it in mine, because I seriously got no pictures of people!!! Enjoyed meeting you - you certainly made my post office experience much smoother. Thanks for helping to plan the picnic and for being so awesome in general. AHH I LOVE THIS! It was so great meeting you in person! :D :D :D :D :D Until next time!! Very, very cool! I'm always horrible about taking pictures at events. I have good intentions but then I get carried away talking and forget. I usually get some, but not many. I have never been to BEA but I went to ALA and it was GREAT! Thanks for sharing with us, I loved hearing all about it and seeing all the great pictures! You are so super fabulous at taking pictures. I failed at it this year.